Tribology Wikipedia > What Are Lubricants? Lubricant is a substance which is used to control (more often to reduce) friction and wear of the surfaces in a contact of the bodies in relative motion . 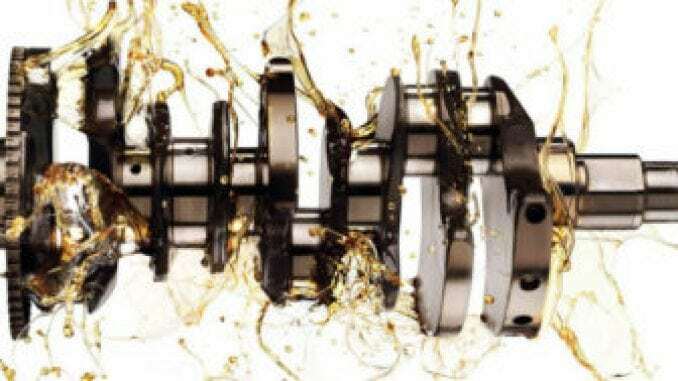 Depending on its nature, lubricants are also used to eliminate heat and wear debris, supply additives into the contact, transmit power, protect, seal. A lubricant can be in liquid (oil, water, etc. ), solid (graphite, graphene, molybdenum disulfide), gaseous (air) or even semisolid (grease) forms. The liquid lubricants can be classified based on the base oil to synthetic/semi-synthetic, mineral or environmentally acceptable (biodegradable) oils. Most of the lubricants contain additives (5-30%) to improve their performance. The history of lubricants started thousands years ago, as early as in 2400 BC (and possibly earlier) an Egyptian statue to the grave of Tehuti-Hetep, El-Bersheh was transported with the aid of liquid (oil/water) lubricant in order to reduce friction between sledge and ground/sand. By 1400 BC Egyptians used animal fat to lubricate chariot axles. However, the solid theoretical understanding of the lubricant action was only possible with the development of the viscous flow laws discovered by Sir Isaac Newton in 1687. Based on the laws of viscous flow, Professor Osborne Reynolds developed the classical equation of thin film lubrication. This equation is the basis of the classical hydrodynamic lubrication theory and is the most widely used theory of lubrication. All the surfaces in nature are rough, at least microscopically (or even at atomic level). When two rough surfaces slide against each other (or roll) the asperities of the surfaces come close to each other and interlock, adhere and generate friction. 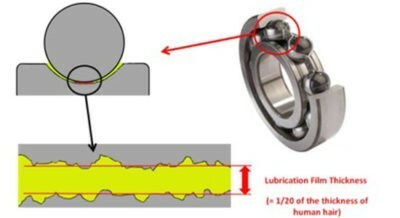 The goal of any lubrication approach is to separate the rubbing surfaces by a lubricant layer, which prevents (or at least minimizes) direct contact of the bodies  as shown in the figure below. By choosing appropriate lubricant, the friction and wear of the materials can be controlled. liquid lubricants: all liquid lubricants, including mineral, natural, synthetic oils, emulsions, etc. gaseous lubricants: typically its air, but can be any other gas. semisolid lubricants: greases, generally consists of a soap emulsified with mineral or vegetable oil. Anti-wear additives (AW): reduces wear by the growth of protective layer on the surfaces (zinc dialkyldithiophosphate). Extreme pressure additives (EP): protects the components from seizure by the formation of the coating on the surfaces (graphite, molybdenum disulfide). Friction modifiers: used to control friction, typically made of solid particles (graphite, molybdenum disulfide, tungsten disulfide, etc.). Corrosion inhibitors: protects the surfaces from the attack of chemically active substances, such as oxygen, by creating a corrosion resistant layer. Viscosity Index Improvers: used to prevent or minimize a decrease of the viscosity index of lubricants at higher temperatures. Oil lubricants are also frequently classified into mineral (crude oil) and synthetic (man made or altered, with defined structure) oils. There are several key properties that determine the performance of lubricants. From the lubrication theory perspective, viscosity and density of a lubricant are the most important parameters . Viscosity is the factor that determines the thickness of a lubricant film, that separates the surfaces (higher viscosity, thicker is the film, see hydrodynamic lubrication for an example of an equation). Based on the film thickness and the combined roughnesses of the surfaces, the lubrication regime is typically determined and hence the level of friction. It should be also noticed, that viscosity characterizes the internal friction of the lubricant and therefore, if the viscosity is too high, the lubricant friction itself becomes high and therefore the benefit of using a lubricant can be small. Density of the lubricant also influences the film thickness of the lubricant and therefore impacts the lubrication regime, even though it has a smaller impact. Essential Concepts of Bearing Technology, Fifth Edition (Rolling Bearing Analysis, Fifth Edtion) 5th edition by Harris, Tedric A., Kotzalas, Michael N. (2006). Some Problems of Lubrication, W. B. Hardy, Nature volume 106, pages 569–572 (30 December 1920), https://doi.org/10.1038/106569a0.